.:Soul:. 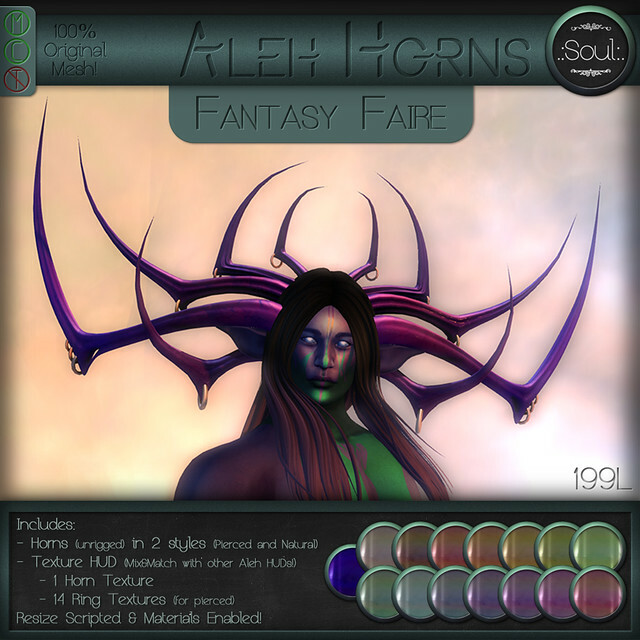 Fantasy Faire Edition Aleh Horns | .:Soul:. ~JUST~ Released for the Faire! Special Edition textured Aleh Horns that you can mix & Match with the others coming out this weekend! Comes with the HUD for texturing those horns that Purple, plus the Rings all the colors shown, along with the horns as either Natural, or Pierced! 100% of the Fantasy Faire editions will got to RFL too! You can pick them up on the Mudrana sim. This entry was posted in Body parts, Events, Fantasy Faire, Female, horns, Male, New Releases, Unisex and tagged Accessories, Fantasy Faire, horn, horns, HUD, pierced, rings. Bookmark the permalink. Pingback: .:Soul:. @ Memento Mori | . :Soul:.